Exiled princesses Pira and Lono travel to avoid the clutches of Pira’s mother, the Evil Queen. Obtaining jobs as adventurers, the two best friends set out on a series of quests that land them in perhaps more excitement than they’d bargained for. This lush hardcover series collects and remasters the ongoing adventures, written by creator Josh Tierney and illustrated by a rotating collection of some of the finest sequential artists on the web. The series, which first began as a popular webcomic, brings artists together from around the globe to showcase their talents as some of the premier fantasy artists in the industry, and Volume 3 is no exception! 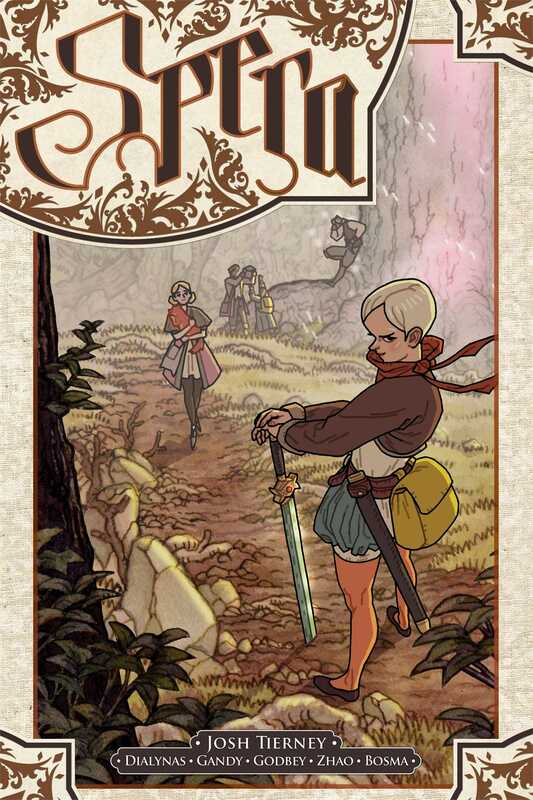 Featuring artwork from Cory Godbey, Michael Dialynas, Afu Chan, Meg Gandy, Amei Zhao, and Sam Bosma, Spera Volume 3 will transport you to a colorful world of wonder and excitement!